Here are some great videos to help you practice writing the alphabet. 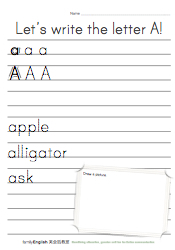 Click on a letter below, watch how to write the letter, then practice lots! Don’t worry if you can’t write perfectly, neither can we! The important thing is that you know the basics and that you use what you learn. Need some practice sheets? Click on the image to the right for a set of twenty-six sheets, one for each letter in the alphabet. We’ve left plenty of space to practice and for teachers to add their own words. Here’s a sample video, below.